Characterized by a Western sound, synchronized dance moves and a repetitive and addictive melody, and sung by well-crafted performers with a dedicated following, K-pop, or contemporary South Korean music, has become a defining aspect of modern Korean culture, gaining international recognition over the past decade. The government, media and entrepreneurs have taken a keen interest in K-pop, which has managed to bring Korean influences to various corners of the world. Its impact goes beyond the Asia-Pacific to unexpected nooks in parts of Europe, the Americas and even the Middle East. Clearly, the success of K-pop is very much real and its legacy significant, so the difficult question remains: How are we to make sense of this sudden development and outgrowth of South Korean popular culture? By discussing the preconditions and changes in South Korea that led to the development of export-oriented K-pop, Lie provides a detailed analysis of the music genre to explain the country’s economic, social and cultural transformations. “I think K-pop is very interesting because it really says a lot about South Korea. If you think about all the major social and cultural changes that have happened in the last 20 years, (you can see that) K-pop really exemplifies all of that,” said Lie in an interview with The Korea Herald on Wednesday. Lie’s new book delves into K-pop, touching on various aspects including its historical development, characteristics and sociocultural meaning. The sociologist not only traces the history of South Korean popular music ― including its pre-modern background, Japanese colonial influences, post-liberation American impact and recent globalization ― but also describes K-pop as a uniquely South Korean system of economic innovation and cultural production. Lie believes that the very nature of K-pop such as its rejection of the traditional, reliance on techniques and styles taken from non-Korean sources, and export-oriented nature essentially embodies South Korea’s innovative spirit and drive toward modernization and economic development. “There are very particular features about South Korea that make it an economically innovative country. It is very unique in that it imports everything and adapts very quickly,” said Lie, citing the success of major South Korean conglomerates such as Samsung and Hyundai. “The same strategies and tactics that (the companies’) innovators used, you can see in K-pop is well. They get whatever is good ― design from Denmark, production technology from Germany, marketing strategy from Japan ― and bring them together. And K-pop is the same. They don’t really rely much on Korean things but rather outsource almost everything,” the author said. According to Lie, the defining elements of K-pop can also reveal key sociocultural changes that have swept through South Korean society over the last two decades ― including the decline of Confucian ethics, the forgetting of past rituals and values, and the emergence of a worldly societal order and standards. “Take something like beauty. K-pop stars today are supposed to be handsome and beautiful ― tall, thin, with a chiseled face and a built body ― (in stark difference to) 30 years ago, when South Koreans had more traditional, agrarian ideals of beauty,” the professor said. “(South Koreans) have given up traditional reservations on everything including plastic surgery to showing your body. Because, to be an Americanized, global pop star, you need to be suggestive in some way ― show your body, beautify your face ... According to traditional Confucianism, you’re supposed to honor what your parents gave you, but today, plastic surgery is widely accepted,” he explained. 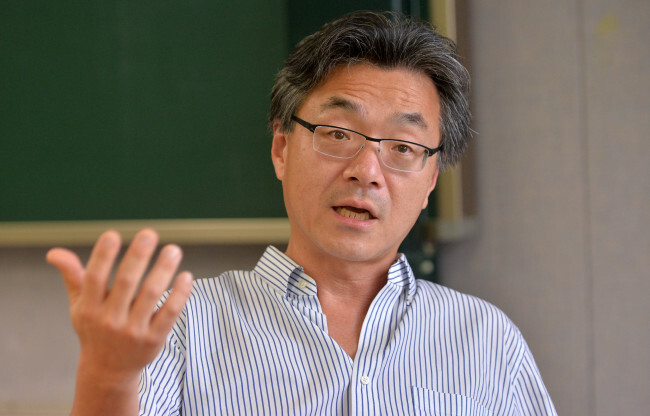 Nonetheless, as much as K-pop is essentially a heavily Westernized form of music, the South Korean pop music genre embodies original standout qualities that make it appealing to select audiences around the world, said the professor. In fact, personally witnessing an audience of largely European fans at a K-pop concert in Paris, sponsored by SM Entertainment in 2012, was what initially sparked Lie’s interest in the music genre. As contemporary South Korean music continues to expand and transform in line with new trends in the global pop market and among fans around the world, Lie’s book provides insights into the global pop culture phenomenon that has transformed South Korea into the entertainment hub of the East. “K-pop: Popular Music, Cultural Amnesia and Economic Innovation in South Korea” is scheduled to be published in November by the University of California Press.